There is one interior turret visible upon entry through the exterior door. The specific antenna that spawns drones has a range of 300 meters and is named: "EMERGENCY - REQUESTING ASSISTANCE". 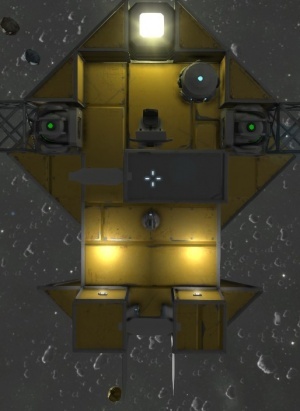 This antenna within range will spawn a Assailant drone in defense, at 3000 meters away from the player and every 5 minutes up to a total number of 3 drones active any time. 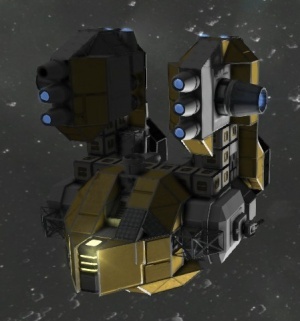 You may not need to attack at all, but if you do, try attacking the Gatling turret on the ship's right hand side; the gravity generator is on the ship's left, and attacking from the left may result in its destruction. Orientation: the floor plan's south (or down) is the ship's forward direction. The outer door is at the front of the ship, which is shown on the bottom of the floor plan. The beacon, located at the rear of the ship can be seen at the top of the floor plan. Upon entry from the exterior door, you'll be confronted with an interior turret, to the left of the turret, there is an interior door that leads directly to a room with the cockpit, and no further defences. Directly behind the beacon there is a steel catwalk that can be easily dismantled to gain direct access to the ship's cockpit. Each of the two large cargo containers can easily be raided. The refineries are also connected to the conveyor system. There are two small reactors outside of the ship. 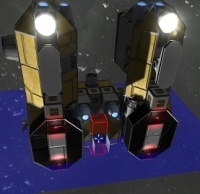 As of v.1.030 (list), the new Mining Transport has gained 2 connectors and the Conveyor system is improved. The small reactors are now located outside of the ship. The cockpit has changed from type 2 to type 3 and the viewing port above it is now made out of glass instead of a steel shutter. This page was last modified on 11 November 2015, at 08:45.